If you'd just parted with £3M for a luxury apartment in Kensington, the most expensive place to live in the UK, you'd be surprised to discover it's also the most polluted place to live too according to Public Health England. The main offenders are the modern diesel engines which emit Nitrogen Dioxide gas (NO2) and fine diesel particulate matter. These particles are measured in 'parts-per-million' so they're too small for most filters to sieve out completely. You need a PM2.5 filter to stop enough of the microscopic polution to stay within World Health Organisation guidelines. To stop NO2, which is a gas rather than tiny airbourne particles, you need an activated carbon filter. Fortunately there's at least one person in Kensington with both PM2.5 and NO2 filtration on his domestic ventilation. Sadly he's probably the only person who does. Solarcrest were originally approached to solve a damp issue caused, as usual, by poor ventilation. The bolt-on PM2.5/NO2 filter was an after-thought. While we offer these filters everyone in a built-up area, most people would rather have a granite worktop or high definition TV. 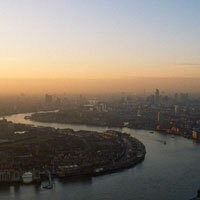 Few people realise how bad air quality has become in many built up areas and how it can seriously affect your health. London, Birmingham, and Leeds are among many other UK cities in breach of EU safety limits, prompting legal action that led to a supreme court ruling in April forcing the government to publish a clean-up plan by the end of the year. If all goes according to that plan, in 15 years our friend in Kensington might not need his super filter. In the meantime he caN sleep safe in the knowledge that his home is free of the nasty invisible pollution. The MVHR retrofit itself was far from ordinary too. With 800mm thick stone walls to drill through and expensive fixtures and fittings to protect you need a pretty impressive team of installers. One slip up or breakage and you're suddenly out of pocket. Well done lads..
"Solarcrest installed a ventilation system as a retrofit in an old Victorian house in Central London, without touching any of the historical features and without unmounting the ceilings. A very impressive job and I am really pleased by the much fresher air in the house. I would also strongly recommend the diesel particle filter."